When I was a kid, if my parents mentioned the words road trip, a scowl instantly appeared on my face. These words would have implied a trip to visit relatives either in New Jersey or Maine, and although I love my family, spending countless hours trapped in a car was sheer torture, especially because I had a history of throwing up in them. Since moving to Texas, however, road trips have become a fixture in my life, whether it be driving six hours to Louisiana to visit Jeff's parents or twenty-five hours up to New York to visit mine! It doesn't matter; I actually value time spent in the car with Jeff and Milt, and I still do love my Dairy Queen Blizzards. This summer I made the monumental decision to leave my darling Jeffery at home and to take the boy and run! 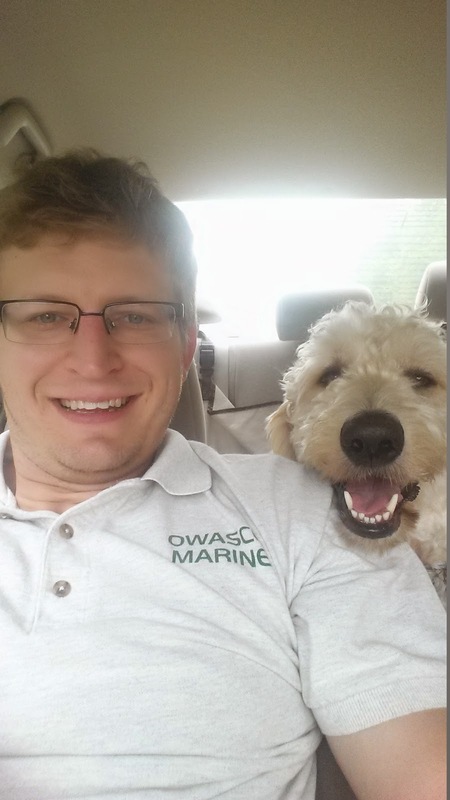 In other words, Jeff drove his lovely wife and sweet goldendoodle all the way up North to safely deposit them for the entire summer (two whole months!) with his mother-in-law. We did this long haul before, and it was not the most enjoyable experience, despite a night with relatives, because we conquered the mileage in two days, which made for two very long days. This time I really wanted to explore a bit more, so we plotted out an interesting route, including a couple of quintessential Southern cities, although it was not the most direct route as many people chose to point out to us as if we didn't already realize that...! We chose to take a five-day jaunt, or rather journey, with a night outside of Atlanta with my family, next stop Savannah, followed by Charleston, and last Richmond before arriving in New York. I am not much for scrapbooking, and I rarely develop photographs unless I plan to frame a particular one, so I really do enjoy documenting our travels on Goldilocks & Her Doodle. Some day I would actually love to print the many posts from this blog and bind it together in a book, so for now, enjoy this picture tour of our grand adventure! The first leg of our trip was the longest with a straight shot of eleven hours to reach my Aunt Carol and Uncle Jimmy's house outside of Atlanta, Georgia. That was a bit much for the three of us, so we broke it up by eating lunch in Jackson, Mississippi. I searched and searched online, particularly on Diners, Drive-Ins, and Dives, to find the perfect lunch spot (I really wanted Southern food. ), but, surprisingly, many home cooking restaurants were closed on Saturdays, so we settled on Rooster's, a hamburger joint, which was really quite pleasant; I still need to add all of my official reviews to Yelp! Quick pit stop for lunch! Cheeseburger on a jalapeno cheddar bun with mac & cheese -- May I be bold to say -- Everything is better with cheese and on a boat! Quaint main street -- It looks like the set of a 1950's movie. We needed (probably Jeff's one wish on this trip) to see the stadium of the Alabama Crimson Tide -- Roll Tide! After five hours, we finally reached Aunt Carol and Uncle Jimmy's beautiful home in the Georgia countryside. Dinner with the fam -- The highlight was a chocolate chip cookie tasting contest! I suppose Diesel is Milt's second cousin. Breakfast with even more family -- How nice! After we said some sweet goodbyes and grateful thank yous, we were on the road again! A sweet little face peeping out while we pump gas. It was a solid four-hour drive from Atlanta on over to Savannah. Once we arrived, we immediately checked into our hotel, so we could unpack all of our valuables (laptops, basically) and my massive suitcase. La Quinta was our hotel of choice on this trip because they allow dogs without an additional pet fee, which is always nice. We actually booked all of our hotels through Bring Fido. This was an invaluable resource for our trip because we could plug in our destination city and all of the dog-friendly hotels, restaurants, attractions, etc. would pop up. The best part was that we actually got the lowest rate (generally $70) booking through them rather than directly through La Quinta. Next time you are planning a journey with your pup, definitely visit this website. Milt tends to blend in. Upon arrival, we relaxed a long while in the cool air conditioning because driving in the heat with Milton cooped up in the back seat can be unpleasant at times, so we hit the town late (4P.M. ), which was quite characteristic of this trip. 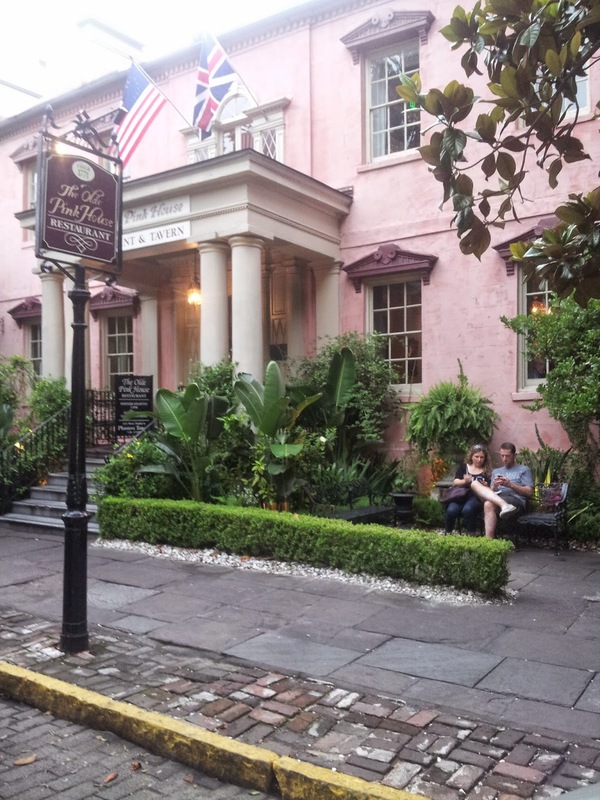 One of the main attractions in Savannah is River Street, so we toured there first. These riverboats always remind me of Gone with the Wind - The entire trip did actually. A stop for me to pose - I was getting a bit fed up with being the sole photographer with no documentable presence on trips. I went into the shop first while Jeff waited outside with Milton, and I picked up two, exactly two, pieces of taffy for us to try, but then I thought Jeff might want to have a look around, and, of course, he wandered out with a whole bag full of taffy plus pralines! Lots of yummy flavors to choose from, and normally, I am not a fan of taffy, but I really enjoyed sampling these. Making the taffy to the left and praline formation in the foreground. So many shops in Savannah were dog friendly, which was just amazing! It was so nice for all three of us to be allowed to peruse a shop rather than one plus Milton being left on the doorstep. A general rule of thumb is if a business sells food, then dogs are not allowed. We were quite surprised though that a few food specialty shops, like nuts and honey, did, indeed, allow our four-legged friend inside. We were a big fan of Savannah Bee, and we purchased multiple gifts there for upcoming birthdays. Sometimes Milt does get a little goofy in shops, though, and Daddy Doggie doesn't help the situation too much...! 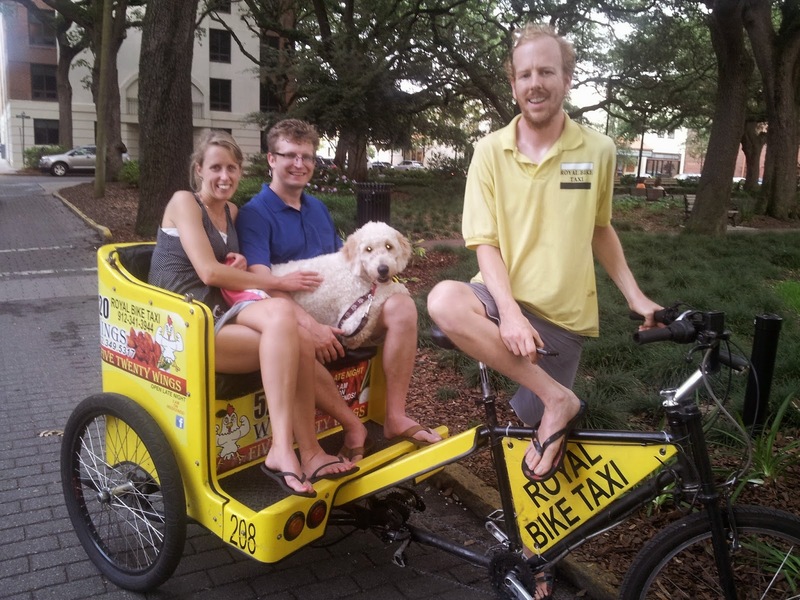 The very best part of Savannah was our pedicab ride that actually included Milton! A few years ago my mom and I went on one throughout Central Park, and I absolutely loved this mode of transportation, so when I saw them offered in another city, I jumped at the idea! The man we approached did not balk at all when we asked him to pedal the three of us about, so we paid him $25 for 30 minutes and hopped right in! While biking about town and gazing upon Southern mansion after mansion, we heard some of the history of Savannah and the Civil War. Unfortunately, since we had Milt with us, we were unable to take any official tours because we did not feel quite comfortable leaving our goldendoodle puppy uncrated in our hotel, but in each city we visit, we certainly took in the local culture and ate up! After the pedicab ride, we relaxed at The Olde Pink House a delightful dinner recommendation from my cousin Peter. A beautiful restaurant connected to Planters Inn. Fried green tomatoes -- I have actually had quite a fixation on these since seeing the movie years ago. Seafood pasta -- Jeff and I managed to split all of our meals on this trip, which was quite a change of pace for a non-sharer, like me. Our evening also included another very special moment. This is a selfie. I am somewhat embarrassed to say we took one, but we absolutely had to because these were the benches in the park where Forest Gump sat with his box of chocolates! The next morning Milt and I took off on a straight four-mile walk to River Street while Jeff finished up a few things and later met us. The problem with arriving late to a one-night stay in a city is that you just don't have enough time to see everything! I wanted to view the water and mansions just one last time. Attempting to beat the heat in a local fountain - We were not the only dog owners condoning this...! We also just had to stop by Paula Deen's restaurant, The Lady and Sons, to pick up some lunch to go. At first, we had our hearts set on a salmon BLT, but we, Jeff more so, were easily talked into getting their Southern buffet boxed up in multiple pieces of Styrofoam. Cruising down the highway eating fried chicken is terribly messy yet satisfying. The iconic storefront - While standing here, I texted a few people this picture to incite jealous...! Inside the shop -- Jeff and I are actually not major Paula fans, but we did receive two of her Southern-style cookbooks for a wedding present, and it just seemed like the place to chow down in Savannah. Greasy fingers -- Jeff loved the chicken, but I actually prefer Bubba's in Dallas! Mac & cheese and the veggies -- Jeff and I almost got into a brawl because he picked the veg without my input, and who picks boring old green beans when we could have been indulging in squash casserole!? Butter cake -- My biggest takeaway of the meal was that Paula is apparently bananas over butter. 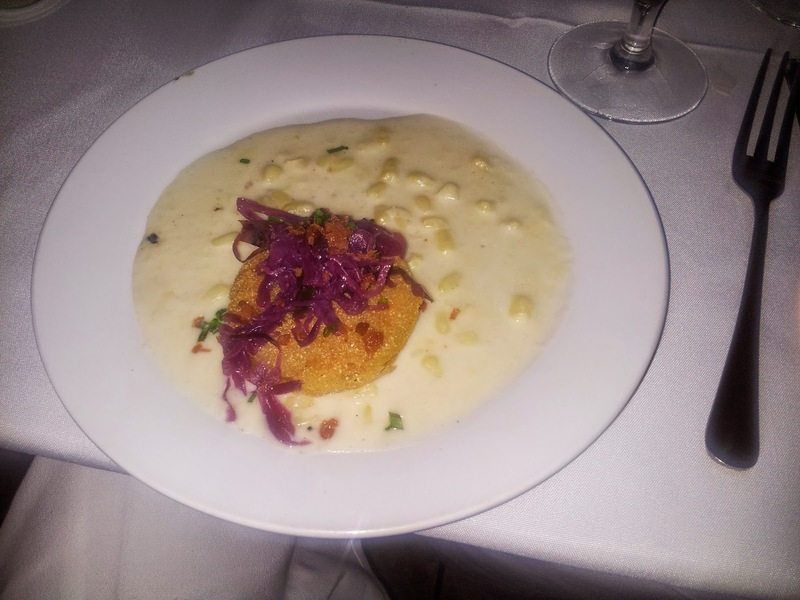 If you hadn't already guessed, this was a full-on gastronomical tour of the Eastern coast of the U.S. - yum! Back in the car again -- Some folks use the arm rest for their arm, but this one is just the perfect position for Milt's snout! It was, thankfully, only a short two-hour drive to Charleston, South Carolina -- What a breeze! This time we were too early to check into our hotel first, so we visited a fantastic local dog park -- James Island County Park. Well, actually, we didn't just happen upon the dog park; it was in our plans thanks to Bring Fido! A dog park with a lake -- What could be better? This sign did not seem to deter either Milton or me from entering the water. Beautiful lake complete with palm trees! An entire two acres to run and play! Charleston was both Jeff and my favorite city by far! It was so pleasant wandering through the adorable streets lined with beautiful houses by the waterside. Fort Sumter in the distance to the far right -- Shots were fired there and began the Civil War. Giant swings on the pier -- One, luckily, opened up just as I was walking by! A massive fountain designed for playing in -- Unfortunately, no dogs allowed. A piece of history -- See the below. I always admire bold colors. Another respite in a downtown dog park -- We love them! The Battery -- Jeff did not encouraging the snapping of any photos the entire trip, except for this one! Both of us checking out the water. Milt was just about ready to hop in! Oh, to live in a pink house -- How delightful that would be! Both Jeff and I were enamored by the ivy growth on the steps. Another dog friendly locale with lots of water bowls sitting out and about! 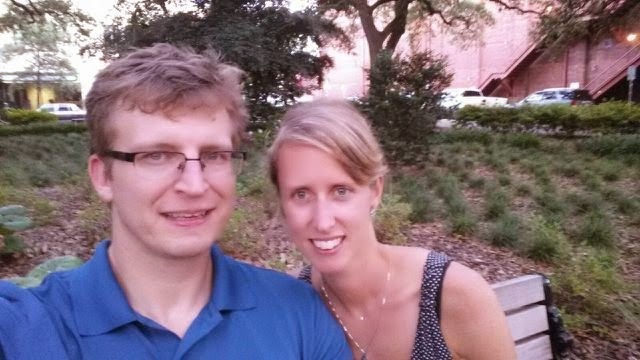 In both Savannah and Charleston, we paid a pretty penny to eat fancy dinners out because we wanted a real night to remember! I suppose it is somewhat like One Night in Bangkok (We did that last summer!) but classier. Another house, now a restaurant, that I would not mind living in! The restaurant was named after Poogan, a dog, whose owners moved, and he stayed behind to guard the house and eventually the restaurant. She-crab soup crafted from the tender meat of the female crab. Pimiento cheese fritters -- It is not every day that you get to sample these! 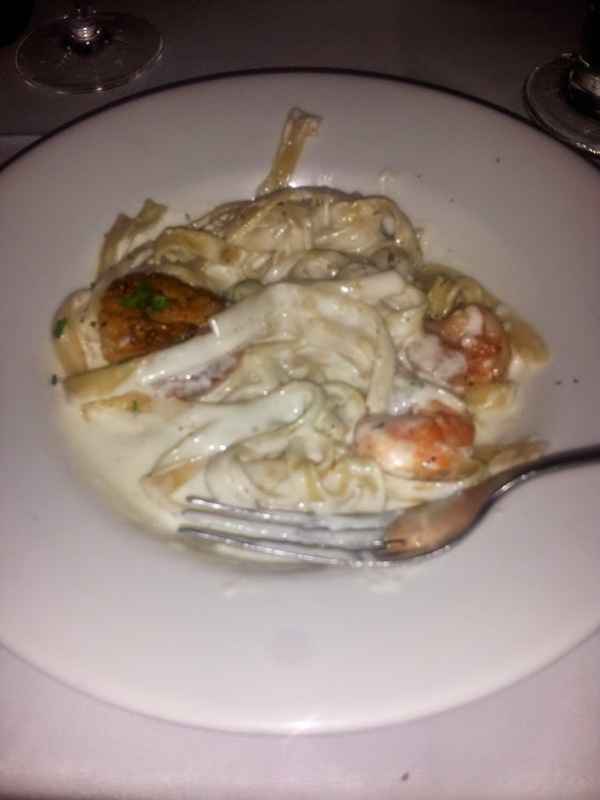 The classic shrimp & grits -- I had never tried this before, but Jeff said it was the best he ever tasted! Like Savannah, we felt the need to hit the town once again the following morning before departing. We wandered through the City Market perusing the wares; halfway through, we realized that dogs were not allowed, and Milton was politely asked to leave. Lots of eclectic arts and crafts, food specialties, and picturesque paintings! We intended to rent beach cruisers for the morning, but with temps already in the 90s, we thought it was best to just hit the road for a six-hour drive to Richmond, Virginia, our final stopping point before New York. One bright spot on this route was Wilmington, North Carolina, a gorgeous beach town that my brother Dave, who surfs there every year, insisted we visit. Unfortunately, no dogs are allowed on the beach during the peak season, so we just viewed the splendor from afar. We might have to return here one day. We did break to eat in Wilmington, however. We just had to try Carolina barbecue that places a lot of stock in vinegar. Jeff googled around for the better part of an hour to ensure we picked the perfect BBQ restaurant. The massive oak the restaurant was named after -- it was the perfect dining experience. We arrived in Richmond past midnight, and we were on the road by 8A.M. the next morning. After five days of travel, we were a bit impatient to arrive at our final destination! Would we do it again? Yes, oh yes! Jeff and I, Milt too, had an absolute ball! The only trouble is we are running out of fresh driving routes to New York. I now have ambitious new ideas for road trips around the Pacific Northwest (Seattle, Portland area), which I have never visited, and New England (New Hampshire, Maine area) for Jeff to experience more of the northern East Coast. Jeff is now back home in Dallas, and Milt Dog and I are here in New York with Mom. It should be a summer to remember although we are counting down the days until we see that Daddy Doggie again...! Wow love the tour of the low country! I love how Milton got to leave his mark during this road trip as well. So cool to see so many dog friendly establishments among all that history. It looks like you had a blast breaking up your trek to the north. We had so much fun, Jenny! Thanks for reading! I am loving it here, but I am looking forward to being back in Dallas with everyone! What a delightful journal of your trip! I enjoyed the vicarious experience. You must have had a ball. Thanks for letting me enjoy it this way, too.